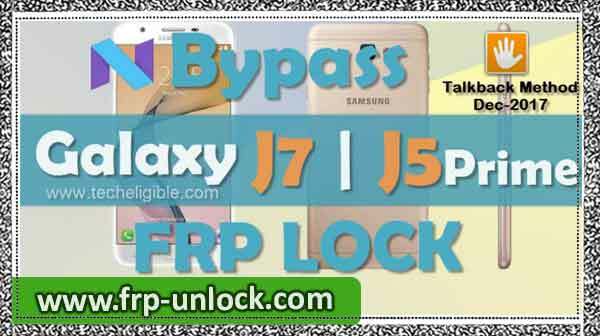 Bypass the Google Accounts Galaxy J7 Prime and also using the Galaxy J5 Prime Android 7.0 talkback method, this method is very famous and works perfectly on Android Noga devices, you can easily bypass the FRP lock by enabling USB debugging options on the J7 Prime And J5 Prime. First connect your Wi-Fi to your device. Step: After successfully connecting “Wi-Fi“, go back to Welcome screen. Press “Home button” 3 times to enable the “Talkback” feature. Step: Once “Talkback” is enabled, you’ll have a screen of “Talkback Tutorial”. To get the “Global Context Menu”, swipe to the right to draw “L” and draw “L”. Step: Again swing down on the “TALKBACK Settings,” screen and drag “L”. Step: After double tap “ok”, double-tap “stop feedback” is. Step: Now, tap on “Help and Feedback”. Step: Tap on “Search Icon”, and then type there “V”, after that tap on “Get Started with Voice Access”. Step: Now, tap on “Play Icon”, after that “Arrow” icon, and then “3 dots”. 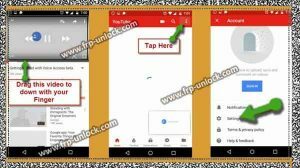 Step: I hope “Youtube” has opened on your J7 Prime, J5 Prime device, BACKGROUND Google Account Galaxy J7 Prime. Step: Drag down “Youtube Video”. Step: Tap on “3 Dots” from top right corner, and then tap on “Settings,“. Step: After that, tap on “About”. Step: After that, tap on most relevant search result, as shown in find below screenshot. Step: Download from there “Apex Launcher 3.1.0”. Step: After download finish, tap on “Bookmarks” from bottom of your browser bar, and then “History”, after that tap on “Download History”. Step: Now, you’ll be able to see “Apex Launcher” there, just tap on that to Install it. Step: Once downloading finish, tap on “OPEN” to launch Apex. Note: In case you get “Installation Blocked” Pop-up, tap on “Settings,“, and then enable “Unknown Sources”, after that you can easily Install apex launcher app. 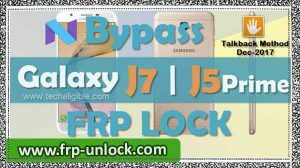 Step: Now, you’ve accessed your J7, J5 Prime, but still your device has FRP lock, to bypass google account Galaxy J7 Prime, we need to enable usb debugging. Step: Open “Calculator”, and then type there this code “(+30012012732+”. Step: After rebooting finish, you’ll have “Talkback”, press both “Volume up + down” keys together to disable talkback. Step: make sure, device is switched on. Step: Now, Connect J7, J5 Prime to Computer via Micro USB Cable. Step: Download from there “Samsung USB Driver“, and also ” ADB FRP Bypass” tool (find below screenshot). Step: Extract “Samsung USB Driver“, and Install it in your computer. Step: Now, make sure your device has successfully been discovered by computer, for that, Right-Click on “MY COMPUTER”, and then “Manage”, after that “Device Manager”. Step: Now, you can see there “Com Port” of your device, this is the confirmation that your device is connected. Tap Tap “➔” after tapping “I” that symbol. Step: Now, tap on “Add an email address,” and then select “Outlook, Hotmail, and Live”. Step: Now, type your valid Microsoft account. (In case you don’t have it, then create it, make it free). Note: In case you don’t have a Microsoft account, try one below.